The Roman Empire was a time of great change and improvement. These changes were not simply restricted to the social and political realms, but also consisted of major military and technological advancement. As the defensive techniques of the armies besieged by the Romans became more effective, high impact machinery quickly became a necessity for success against them. The Romans began to aggressively engineer and build new offensive military technology that pushed for stronger and more practical ways to breach enemy defenses. In the end we see dramatic development of machinery allowing Rome to have the upper hand in siege combat. The most important inventions of this kind include the Tortoise, Battering Ram, Onager, Ballista, and various applications and moderations to the Testudo formation. These many changes and advancements in technology allowed the Roman’s to find success under the ever growing pressures of siege warfare like never before. The common Roman infantry shield or Scutum did not always provide the necessary protection required, even in the Testudo formation (W. Contributors, 2013). It quickly became clear that in order to approach enemy defenses without being taken out by the oncoming fire, a mobile defense structure or shield was necessary. The Ancient Vineae was a good start towards a structure of this kind; however, over time the Roman’s modified the Vineae to develop a structure referred to as the Musculus or Tortoise (Nossov, 2005). Caesar describes the overhead covering in one the Siege of Massilia (49 BC) by saying, “… the musculus was covered with tiles and mortar, to secure it against fire, which might be thrown from the wall. Over the tiles hides are spread, to prevent the water let in on them by spouts from dissolving the cement of the bricks. Again, the hides were covered over with mattresses, that they might not be destroyed by fire or stones…” (Caesar, Civil Wars, 2.10). Caesar also describes these structures as being 60 feet long, thus sheltering many men which provided the man power to destroy heavily fortified wall foundations. This imperative war machine allowed the safe transport of infantry to the foot of an enemy wall protecting them from the countless threats including but not limited to arrows, stone, lumber, and boiling water, oil, or sand. Throughout Roman history, the Battering Ram proved to be a valuable part of Roman artillery allowing an invading army to make quick work of enemy defense structures, specifically fortified walls. The actual rams were usually simple in design, consisting of a log with one end made of copper or iron that was usually in the form of a ram’s head. Technicians learned that this combat piece served best when suspended from a frame of some kind. Over time, the ram found its way into the tortoise structure giving the incoming infantry defense as well as the awesome power of the battering ram. These so called “Ram Tortoises” were often quite large (as long as 17 feet) and allowed the incoming infantry a great advantage on the destruction of stone walls (Nossov, 2005). Between the 1st and 3rd centuries ballistae technology begins to become present in the Roman artillery. These technologies required more sophisticated engineering and carpenters to maintain (Feugère, 1993). 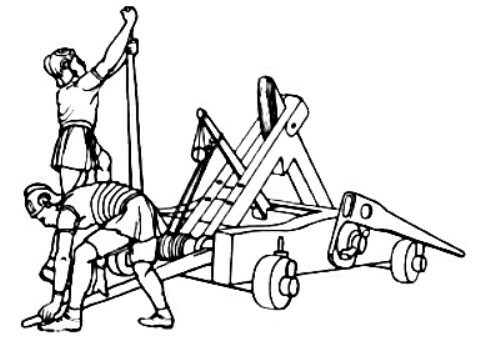 These included the Onager which was the primary stone-projector used to smash walls or oncoming siege engines (depending if you were attacking or being attacked), and the Carroballista which was also used to launch projectiles rapidly against enemy troops (Cavazzi). The introduction of these torsion powered artilleries was the very beginnings of what would become medieval siege weapons, although medieval weapons were non-torsion powered (Hebblewhite, Artillery, 2012). Throwing technology introduced a new power, power from a distance. This new ability forced those being attacked to develop new defensive precautions and strategies to satisfy their defensive needs. Although the throwing technology was just in its infancy, the importance of such technologies become prevalent at this time and continued to grow in the centuries to come. The stride of Roman technology truly is a spectacle. The new ideas at this time clearly demonstrate the ever changing evolution of war and technology even in ancient times, especially regarding technology. By putting forth resources to better the situation of siege warfare Rome learned remarkable skills that would revolutionize the art of warfare, and it would never revert back. The Roman’s deliberately identified and exploited the weakness of their enemies which directly drove them to new technological realms, allowing the Empires following to pick up where they left off and improve things even more. Caesar, Julius. The Civil Wars: Book Two. Trans. W A McDevitte and W S Bohn. 49 BC. Web. 3 April 2014. <http://www.kingsacademy.com/mhodges/08_Classics-Library/hellenist-roman/julius-caesar/civil-wars-02.htm>. Cavazzi, Franco. “Siege Warfare.” n.d. Roman-empire.net. Web. 3 April 2014. <http://www.roman-empire.net/army/leg-siege.html>. Connolly, Peter. Greece and Rome at War. Frontline Books, 2012. Book. 3 April 2014. Contributors, Wikipedia. “Scutum (Shield).” 17 December 2013. Wikipedia.org. Web. 3 April 2014. <http://en.wikipedia.org/wiki/Scutum_(shield)>. Feugère, Michel. “The Arms of the Romans.” 1993. Halshs.archives-ouvertes.fr. Web. 3 April 2014. <http://halshs.archives-ouvertes.fr/docs/00/05/24/19/PDF/Feugere_2002_377_text.pdf>. Hossmann. “Roman Onager.” 15 October 2005. Web. 17 April 2014. <http://en.wikipedia.org/wiki/File:Roman_Onager.jpg>. Hebblewhite, M. K. 2012. Artillery. The Encyclopedia of Ancient History. Hebblewhite, M. K. 2012. Sieges and siegecraft, Roman. The Encyclopedia of Ancient History.